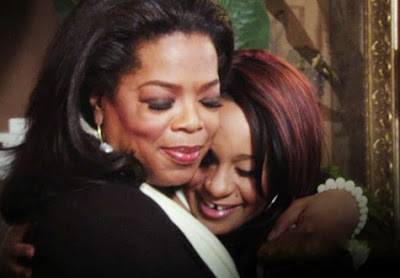 The Death of Whitney Houston: Did You Watch the Oprah Interview with the Houston Family? Thank God for DVR! There was so much on television last night that it was definitely hard to make a decision as to what to watch. Between Magic Johnson's 'The Announcement' and 'The Good Wife', I knew my Sunday was going to be jam packed. But there was one thing that trumped both of these shows for me. It was the Oprah interview with the Houston family following the death of musical icon Whitney Houston. Normally, I don't like to watch shows in real time anymore. I guess you can say the DVR has spoiled me because I hate commercials, but this was one thing I watched from the moment it came on. It was definitely must-see television. I mean let's be honest, no one does an interview like Oprah. I definitely have my thoughts about the interview. I was really hoping to get more insight into the person that was Nippy Houston. For the most part, we know about Whitney Houston but I was hoping to learn about Nippy. Bobbi Kris alluded to her a few times when she talked about her as a mother, but yet they never really gave up anything insightful about the woman and her generous spirit. Maybe it's just the fan in me that is selfish and wants more. I was really hoping to hear about her humanity. I mean even when her brother was asked about what he was missed about his sister he said he missed touring with her and watching her sing. I was just hoping for more. So did you watch the interview? What did you think? First I will say that I was quite surprised that they were willing to interview so quickly. The interview aired exactly one month after her death and less than a month after the funeral. In a way, I thought it was rude to even ask for an interview so quickly, even for Oprah. But I don't know the circumstances surrounding the interview arrangements so I won't dwell on that. I'm not surprised that they chose to speak to Oprah. She's definitely the best choice. I didn't have any expectations really of the interview. I'm glad they didn't get into dogging Bobby Brown. My heart aches for her mother. Can't imagine her pain. I just hope that her daughter takes her time and that she doesn't rush into anything. Healing is a process. The last part about Whitney looking for love and chasing after a young man...well I'd rather not have heard that piece. But them sharing about her wanting love and to feel protected is something that I think alot of women can relate to. I wish they would've given it more time before they interviewed. Everything was so raw and they could've probably offered a clearer perspective on who Whitney really was. Perhpas they thought if the do this one and get it over with then they could focus on healing...can't really blame them for that. I thought the interview was good. But I did feel something was missing as if they were not really telling something. I did not get that they were Shocked at Whitneys death just a "it finally happened" but as Pat put it "something happened earlier that day" know one knows what. Bobby Brown is not the bad guy here. I hope he and Bobbi-Christina can have a wonderful releationship.